1. Start with the noodles. Divide the sesame oil and chilli sauce between two serving bowls. Place the cooked noodles in the bowls, toss in the oil and sauce and set aside. 2. Heat a wok over a high heat until smoking and add the rapeseed oil. Add the garlic, ginger, leeks and Sichuan peppercorns and toss for a few seconds, then add the lardons and stir-fry for 1 minute. Add the Shaohsing rice wine or dry sherry, the fragrant oil and dark soy sauce and stir-fry for 1 minute. Add the stock, tian mian jiang or hoisin sauce and the yellow bean paste or miso and toss together well. Cook for 2 minutes, stirring until the pork is cooked. 3. 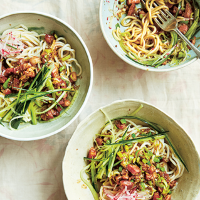 Divide the pork mixture between the two bowls of noodles and garnish with the radish and cucumber matchsticks. Sprinkle with the spring onion and serve immediately. To eat, toss and mix all the ingredients together well. Heat 5 tablespoons of groundnut oil. Add a pinch of salt, 1 tablespoon grated ginger and 1 tablespoon finely chopped spring onion, cook for 1 minute then strain the oil into a glass jar. Keep for 5 days in a cool place. This recipe was first published in Wed Jan 30 11:56:40 GMT 2019.